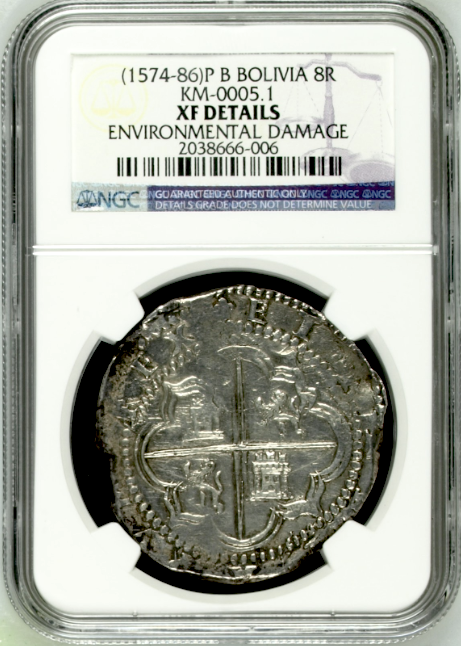 BOLIVA 8 REALES 1574-86 CATALOG # KM-0005.1 NGC XF DETAILS!!! A VERY LARGE FLAN WITH CLEAR DETAILS, ESPECIALLY DISPLAYING THE CROSS, CASTLES AND LIONS! 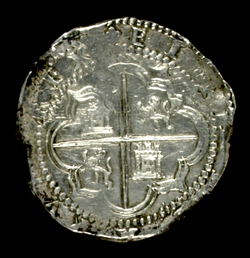 IT WAS CLEARLY FROM A SHIPWRECK TREASURE AS IT'S MARKED ENVIRONMENTAL DAMAGE, CLEARLY FROM SEA SALVAGE- SUNKEN SHIP! A VERY HEAVY AND LARGE PLANCHET AT A VERY AFFORDABLE PRICE OF $595!